Gastroparesis is a disorder in which the normal spontaneous movement of the muscles of the stomach is affected. The stomach's motility is slowed down or doesn't work at all preventing the stomach from emptying properly. 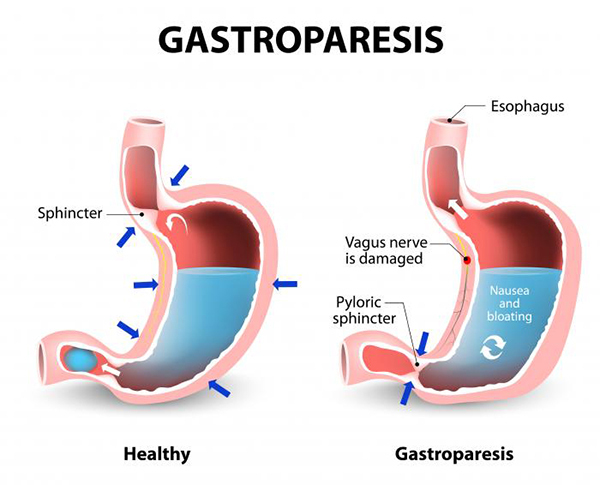 The causes of gastroparesis are not known but it is believed that it is caused by damage to a nerve that controls the muscles of the stomach (vagus nerve). Vagus nerve helps to manage the complex processes in the digestive tract. A damaged vagus nerve cannot send signals normally to the stomach muscles. This may cause the food to remain in the stomach longer rather than normally into the small intestine to be digested. Certain medications slow the rate of stomach emptying such as narcotic pain medications. Modern medicines include medicines that stimulate the stomach muscles such as metoclopramide and erythromycin but metoclopramide has serious side effects such as diarrhoea and the medications to control nausea and vomiting are prescribed but in Ayurveda, gastroparesis can be cured by using herbal remedies and by making some changes in the diet without any side effects. In Ayurveda, it is believed that indigestion is the root cause of almost all the diseases. If the digestive system is alright, it leads to the proper assimilation of the nutrients in the body. 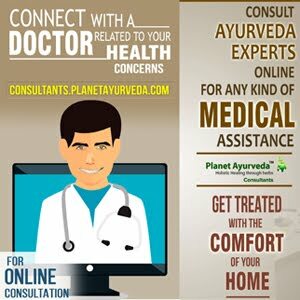 Planet Ayurveda works on the core principles of Ayurveda. Dosage: 2 tablets twice or thrice daily after half an hour of meals with plain water. 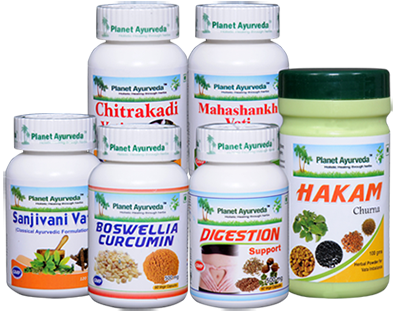 Digestion Support Capsules of Planet Ayurveda is a blend of unique herbs that are described in Ayurveda as the best digestive herbs. These herbs work together in a synergistic manner and controls constipation, flatulence, acidity etc. Sanjeevani Vati of Planet Ayurveda is prepared according to the concept mentioned in Ayurvedic texts. Indigestion leads to the formation of Ama (endotoxins) in the body which leads to the blockage of the channels and many diseases like high cholesterol, rheumatoid arthritis, ankylosing spondylitis and many other disorders. Sanjeevani vati helps to get rid of all the mid-way metabolites from the system and helps in burning metabolites. Dosage: 1-2 tablets twice daily with plain water after meals. Hakam Churna is a wonderful presentation by Planet Ayurveda experts. This combination is known as "Tridoshic Rasayan". This term applies to any supplement that effects the three elements that Ayurveda believes that controls life: Vata, Pitta and Kapha. Hakam churna has the ability to retrieve the normal digestion thereby putting a stop to Vata disturbance. Dosage: Take 3-5 gm of powder with hot water twice daily. Boswellia-Curcumin capsules offered by Planet Ayurveda are one of the most effective combination of anti-inflammatory herbs. These capsules relieve the inflammation of the stomach due to gastroparesis. Curcumin is a very potent anti-inflammatory herb having potent effect similar to the efficacy of corticosteroids. Boswellia contains substances known as boswellic acids. Research shows that these acids can fight inflammation. Dosage: 1-2 capsules twice daily after meals. Chitrakadi Vati is quite beneficial to improve the digestion power of the body as it has digestive and detoxifying properties. It aids in digestion and removes the accumulated toxins in the body and balances all the three doshas in the body. Dosage: 1-2 tablets once or twice a day before or after food. People with high blood pressure should take this medicine only under medical supervision as it contains salt as an ingredient. Our body will only process what all we dump in it. So the kind of food we eat determines how are digestive system will respond. To keep the digestive system healthy, include fruits and vegetables which are rich in fibers which not only aid in digestion but are rich sources of anti-oxidants as well. Include herbs in the diet such as asafoetida, isabgol, fenugreek, ajwain and aloe vera juice in the diet. Avoid junk and spicy food as these foods cause heaviness in the stomach as well as constipation.